Don't panic! Yes, Bovada (formerly Bodog) released the latest odds on there ever being a '12-'13 NHL season, and no, it's not comforting. 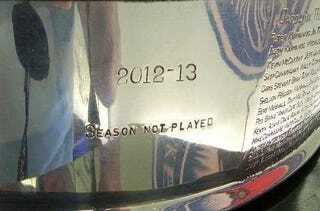 Will the NHL cancel the 2012-2013 Season? But remember that today saw the third day of negotiations between the players and owners, and the location is being kept secret with no post-talks updates for the media. This is a good thing, and even if it doesn't lead anywhere, the future is brighter than it was last week. And this: Bovada's odds aren't necessarily a prediction of how likely the lockout is to end: they're just trying to bring the money in evenly. Just because bettors are pessimistic doesn't mean you should be.